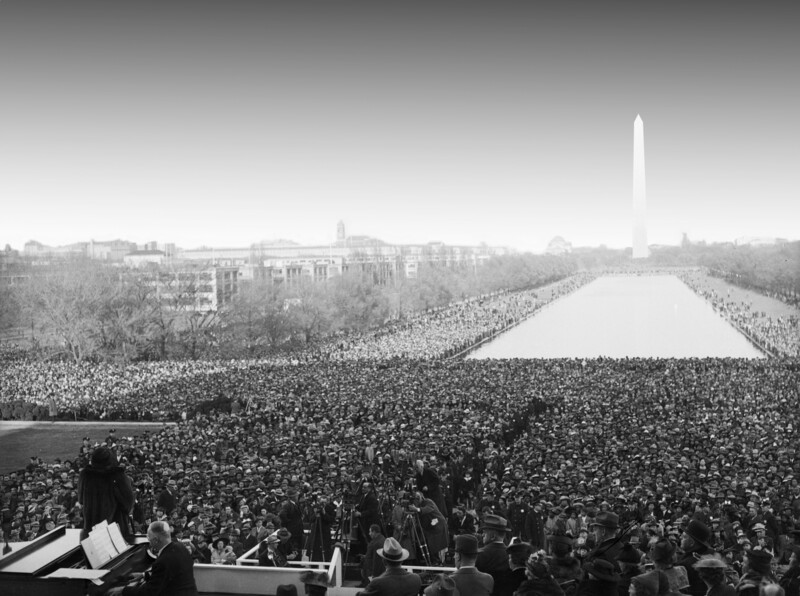 Marian Anderson (lower left) sings on the steps of the Lincoln Memorial to more than 75,000, April 9, 1939. Flip to Marian Anderson receives the Spingarn Medal from Eleanor Roosevelt, July, 1939. After the Daughters of the American Revolution refused to allow African-American Marian Anderson to sing at Constitution Hall in Washington, D. C., first lady Eleanor Roosevelt resigned her D.A.R. membership, and Secretary of the Interior Harold Ickes offered Anderson the use of the Lincoln Memorial. On Easter Sunday in 1939 more than 75,000 attended the free concert, while millions more listened on radio. Anderson's free concert became one of the era's great symbolic moments in the struggle against racism.